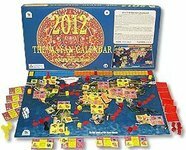 Description: The Mayan Calendar is much more than a system to mark off the passage of time. It is a prophetic calendar that may help us understand the past and foresee the future. It is a calendar of the Ages that describes how the progression of Heavens and Underworlds condition the human consciousness, and thus the frames for our thought and actions within a given Age. To some people it is predicting the end of the world, December 2012. For others, the Calendar is forecasting the start of a new Era. This game incorporates both views. The object of this game is to create a physical vehicle like a pyramid to focus and spread universal spiritual power. For this task we will need builders, materials, equipment and money. We must work together to build 11 Spiritual Centers around the Planet to ward off the many Destructive Perils entering from many directions. How much of the Earth did we allow to be destroyed? How much new spiritual consciousness did we bring into being?